In Sri Lanka’s dry zone, the ancient village lifestyle of puranagama developed around twenty thousand reservoirs, or tanks, which fed sophisticated irrigation systems through aqueducts and canals. The culture was infused with rituals and traditions which treated water as common property. However, by the beginning of this century, traditional life had been seriously eroded by colonial land reforms which designated common lands as government property and initiated the growth of satellite townships. In a bid to preserve the tradition of puranagama, two Non-Governmental Organisations (NGOs) in Sri Lanka have come together and created the Ulpotha Sanctuary, now open to small groups of visitors for twelve weeks a year. Designed around the layout of a deserted traditional village, Ulpotha covers a twelve acre site next to a large tank situated at the base of the Galgiriwiya Mountains in the jungle heartland of Old Ceylon. Ulpotha literally translates as water source, referring to the spring which feeds a system of five tanks which irrigate the surrounding watershed. According to legend, pilgrims travelling from south India in search of Lord Kataragama, an incarnation of the god-child Murugan (the son of Shiva revered in the temples of Tamil Nadu), believed that Ulpotha was the sacred site associated with the god due to the seven hills in the surrounding jungle which corresponded to the description they had been given. In a vision the head priest was shown how to perform a special puja and they built a temple to Kataragama at the entrance to the village. 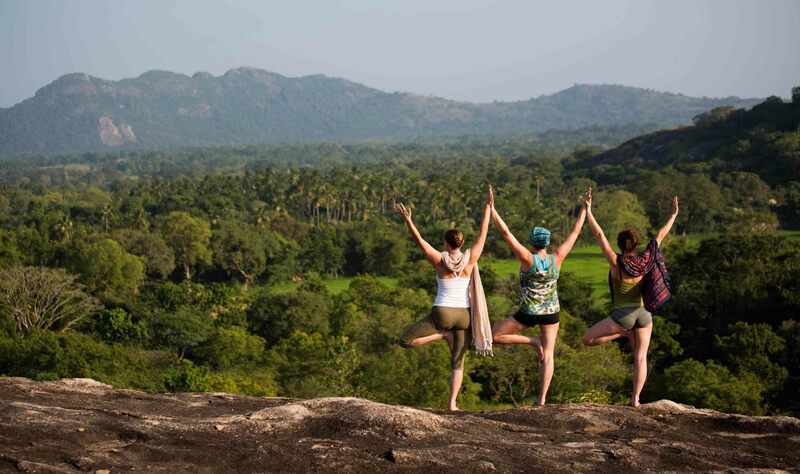 The area was also known as the playground of Prince Salya and the beautiful Asokamala, who escaped the ancient city of Anuradhapura through a secret tunnel hidden in a local cave. The surrounding hills are still home to cave dwelling ascetics and practising shamans. At the centre of the village is the Walauwwa, the traditional manor house which has been carefully restored over the original floor plan. Built around a central stone courtyard with an ancient well, the outer walls are stained pale apricot with a dye made from soaking flower petals in water. The adjoining ambalama provides a covered sitting area with mats, cushions, and fine views towards the surrounding hills, while accommodation is provided in the asanas, individual mud huts which are scattered around the sanctuary. The huts are built around a raised mud platform, open on three sides and covered with a pitched roof of cadjan, a thatch made from woven palm fronds which is replaced every year. The wedegera, or treatment centre, is where traditional healing practices which pre-date the unified system of Ayurveda, are available for those living in the village – steam baths using local herbs are combined with oil applications and traditional massage techniques. A platform has been built under the splaying branches of a banyan tree for the practice of yoga, group meditation or similar activities. Meals are prepared in the murtange, the manor kitchen, cooked in clay pots over open fires. All the produce is organic and grown within the sanctuary, the staple diet being based around a highly nutritious strain of red rice, supplemented by pulses, vegetables and a wide variety of fruits including banana, passion fruit, guava, bread fruit, wood apple, and papaya. Infusions are prepared from coriander seeds, beli leaves and a variety of medicinal local herbs. The puranagama lifestyle revolved around six traditions. Chenna refers to the shifting plot cultivation which allowed soil to regenerate through organic deposits from the surrounding forest. The Kamatha, or threshing floor, provided the stage for ritual dramas enacted for Gods, relatives and Yaksha spirits, bringing the different lokas or worlds, together in one affirmation of life and fertility. The pela was the tree house where the ‘twilight language’ of Ingiya was sung to keep marauding elephants away from the fields. The residence of the local deity, a rock or tree thought to be inhabited by some divine presence was known as the dewale. (Later, under Indian influence, deities were invited to inhabit temples of wood or stone.) Rajakaraya literally means service to the King and was based on the common consensus that financial freedom of the individual was subordinate to the communities collective welfare. The King and his ministers would construct works for the common good, such as entire irrigation systems, and local communities would maintain the fertility and balance of whole eco-systems for the benefit of future generations. The Wewa was the village tank, used for bathing, washing and irrigation. The traditional water management system at Ulpotha has been restored by creating bunds or dykes, which separate two smaller tanks from the main reservoir. By opening the sanctuary up to small groups for 14 weeks a year, the intention is to generate funds for further rehabilitation in the area. ‘Ultimately we hope to turn the whole area into an organic farming basin’, says farmer Viren Perera. Ulpotha will also serve as a blue print for similar projects in other parts of the island. ‘We are trying to stop urban migration by investing in an age old wisdom of Lanka’s alternative mud culture’, explains Manik Sandarasagara. ‘We want to show that you can take a piece of land and make it fully sustainable. Qualitatively we can live better here than anyone in the city. Ulpotha was built as our project report rather than wasting time writing lengthy documents’. At a cost of US$150 a day the Ulpotha experience of ‘living the tradition’ does not come cheap but it was never intended to rank alongside conventional tourist destinations. ‘The village has evolved organically into what it is now’ says Viren Perera, ‘anyone who comes here comes as a guest of the village’. Visitors to Ulpotha will not find the amenities available in a hotel from the same price bracket. The huts are functional and comfortable but simple and spartan. Local materials have been used throughout. The swimming pool is not a blue tiled chlorinated basin but a freshwater lake fringed by flowering lilies. Swimming below surging hills covered in giant boulders and thick vegetation sparks visions of the Garden of Eden. At the end of the rainy season when the tank is spilling over, the excess water creates a natural jacuzzi at one end of the bund. By design there is no electricity, all the lighting being provided by candle flares and oil lamps. ‘The luxury here is nature herself’ says Perera. The concept of eco-tourism has presented the opportunity for an industry which has left an indelible mark on traditional societies around the world to create a symbiotic relationship between developers and the environment. At the same time, it has provided a buzz word to be exploited by the hotel industry in a bid to satisfy the conscience of customers. The Ulpotha sanctuary has pushed the parameters of eco-tourism to its purest extreme, creating a naturally regenerative environment where the conception of time and space seems to be suspended in the flow of tradtional life, untainted by the intrusive pressures of the twentieth century. ‘It is an entirely different experience of sound, smell, looks and everything else’, maintains Manik Sandarasagara. Although the sanctuary is open for groups to pursue yoga, meditation or other courses given by teachers of holistic therapies, individuals are also welcome to come of their own accord. The luxuriant growth of and diversity of plant life within the confines of Ulpotha combined with the sheer tranquillity to make it a unique and healing experience just to be there.